One area of the body that is crucial to successful climbing of all types is the core, including lower back, obliques, and abdominals. A strong and healthy back helps in carrying heavy packs, rescuing climbing partners who have fallen into crevasses, digging snow blocks for wind breaks high on a mountain, and numerous other alpine tasks. Strong obliques and abdominals assist in getting into and out of a heavy pack from lift to transport, successfully maneuvering through awkward overhung positions on challenging rock routes, and maintaining upright posture for hours and hours of travel. Horizontal (i.e. lying on the floor) abdominal training simply will not build the sort of core strength required for outdoor activities and everyday living in the “vertical world.” Below, we share some of the exercises we’ve found to be more effective for application to alpine adventures and sport, including several for the obliques, abdominals, lower back, and combo exercises that strengthen core and upper body together. Do this with a partner or by yourself; if doing this solo, hold onto the ball; if training with a partner, use a 4-6 pound ball to start out and sit facing the same direction as your partner, about 6-8 feet apart. Lean back slightly with your knees bent, feet flat on the floor, and aim for a spot just above your partner’s thighs for easier catching. The farther back you lean, the harder your abdominals and obliques have to work. Keep your abdominals tight in order to protect the lower back, and exhale as you toss to your partner. Be sure to turn 180 degrees and work the opposing obliques. If doing this solo, make a rainbow arc with the ball extended above you, leaning back as far as comfortable without the feet lifting off the floor. This is a great exercise for skiers, paddlers, racquet sports enthusiasts, as well as mountaineers involved in “power belaying,” building snow shelters, and crevasse rescue. This is actually quite a bit harder than it looks! Start with a very light pair of dumbbells first, much less than you’d use for a side bend with dumbbell held down closer to your legs. Stand with feet shoulder distance apart, knees slightly bent, and arms nearly straight up over your head. Take a deep breath and keep the abs tight as you slowly lean directly to one side, as far as comfortable, without bending forward or backward. Exhale as you return to center; then repeat to the other side. Alternate sides until you have completed desired reps, 6-10 each side. This exercise helps increase oblique strength through their full range of motion in lateral flexion, and helps when reaching for out-of-reach holds on vertical climbs. Please use caution when first trying this if you have any history of lower back pain, and think of staying long and extending up out of the spine rather than “collapsing” and compressing downward as you bend. For the Decline Weighted Curl, lie on a slant board with your head lower than the feet and knees bent, or use a bench specifically designed for ab work as pictured. 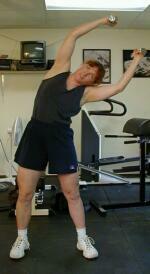 You can vary the angle of the board; the lower the angle, the easier this exercise will feel. Start with no weight at first; then, try holding a dumbbell or weight plate at the chest or behind the head (the longer the lever, the harder this exercise becomes) and curl upward until your chest reaches your thighs. This exercise strengthens the abdominals for moving quickly into self-arrest positions with an ice axe. “Self arrest” is simply a technique used to stop a climber from getting out of control once he or she has fallen on steep snowy or icy slopes. Visualize yourself careening downhill head first on a snowy slope, on your back, with feet uphill. Not only does the added weight in your hands simulate using an ice axe, but if you’re in the mountains it’s likely you’ll have a pack on your back as well, so you’ll need to build abdominal strength with added weight in order to swing yourself around quickly into self-arrest position with a substantial pack on your back. To work the psoas (hip flexors) and lower abdominals, simply turn yourself around so that the feet are lower than the head, and hold on to the foot attachment with your hands. Keep your knees bent and feet close to the buttocks; then as you exhale, curl the knees up toward the chest. To increase intensity, add resistance by wrapping ankle weights around your lower leg, holding a medicine ball or dumbbell between your knees, or wearing ski or hiking boots. You can also use tubing or bands (wrapped around the board and your ankles) or increase the angle of the slant board. Most people focus on the anterior muscles of the body (those that are most visible, on the front) including the abdominals, while neglecting the all-important posterior (backside) muscles including those of the opposing muscle group of the lower back (erector spinaes). Mountaineering involves plenty of bending and lifting, particularly in campsite preparation and rescues. 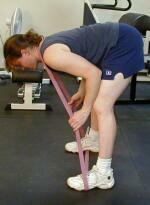 To develop strength endurance in the spinal erectors, try the following exercises. To complete a “good morning” exercise (taken from Eastern tradition of performing deep forward bows in greeting) use whatever resistance you have available to you, in the form of Jump Stretch bands looped behind your neck and low on the shoulders, a weight plate, medicine ball or dumbbell held at your chest or just overhead (again the longer the lever, the harder the exercise), a safety bar low on the trapezius, or a regular straight barbell held behind the back or in front. The key to this exercise is to keep a very slight bend in the knees (don’t lock them out) and back in neutral position as you bend forward. Inhale as you bend down, and exhale as you raise back up to vertical, using the abdominals to work in conjunction with the erectors in order to protect the spine. Start with a light weight and increase the resistance as your strength and endurance improves. This move is very important in safely hoisting a heavy backpack from the ground to your knee to get into position to swing it onto your back; it’s also used in crevasse rescue when pulling a victim out of a crevasse, in belaying a quick climber when you want to pull in as much rope as possible with each arm movement, using your entire body to assist you, and numerous other daily tasks ranging from gardening to laundry to picking up after children and putting things away. This exercise helps develop explosive power in the abs for such sports as track and field events, volleyball, racquet sports, basketball, and for other general daily activities that require some degree of power or strength. To perform the exercise, stand with feet shoulder width (squat stance) apart and grasp a dumbbell or medicine ball in both hands. Squat down so the weight touches the floor, chest forward, weight back in the heels, and then on an exhale, stand quickly up while lifting the weight up and over your head. If the weight is substantial enough, and your velocity high enough, you’ll feel the muscles in your shoulders and abdominals contracting hard to prevent you from hyperextending the lower back. Repeat for the desired number of repetitions, gradually increasing your speed as the abdominals get stronger. For a more advanced version, take a weighted medicine ball outdoors and literally let go of the ball at the top, fully stretched position--just be sure there’s nobody right behind you, and arc the ball back far enough so that it won’t come down on top of your head! A good core exercise for those who want to increase upper body and abdominal strength for overhung climbing routes, or for those who have difficulty doing bodyweight pullups, is the “horizontal pullup.” Position a barbell across low pins on a squat rack and be sure you can fully extend your arms when you lie underneath it with torso flat on the floor. Try this first with knees bent and feet on the floor fairly close to your body, then as you get stronger, extend the legs until the body is nearly straight. 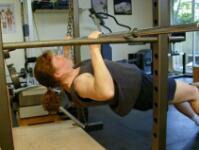 Exhale as you pull your chest up toward the bar, pause a second, then inhale as you lower. For extra challenge, place feet up on a bench, or increase the height of the bar above the floor. Keep the body nice and tight to fully engage the abdominals and pull evenly with both arms. If you have access to thick boating cordage (something that could hold an anchor would work well), secure it firmly in your house and then sit down on the floor with the rope between your legs (it’s okay if the rope doesn’t quite touch the floor.) Hand over hand, pull yourself up using your upper body strength, with heels pressing into the floor to help keep your body from drooping side to side as you lift each arm up. Slowly lower back down, and then relax your grip for 20-30 seconds. Repeat. Try to build up endurance in the hands, forearms, and core by increasing the number of repetitions you can complete before needing a break. 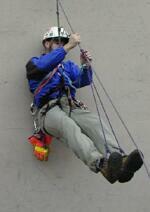 As an alternative that will also involve legs and hips, hook a longer thick rope over something even higher (i.e. think about the “olden days” when you had to climb gymnasium ropes in school) and use your arms and legs to climb up. This is a great way to strengthen muscles in the hands needed for both rock climbing and for prussiking, a technique used to climb out of gaping crevasses requiring use of thin cord on thicker rope. If you are currently involved in heavy training that includes squats, deadlifts, cleans, jerks, or snatches, it’s quite likely that you already have the strength foundation necessary for success in the mountains, in which case including appropriate interval training and cardiovascular endurance training will give you a well-rounded alpine conditioning program. If you suspect you may have some core weaknesses, these exercises may help you prepare for some of the more advanced lifts. Choose 2-3 different exercises (or one from each group), and complete 2-3 sets of 6-10 repetitions in each direction.